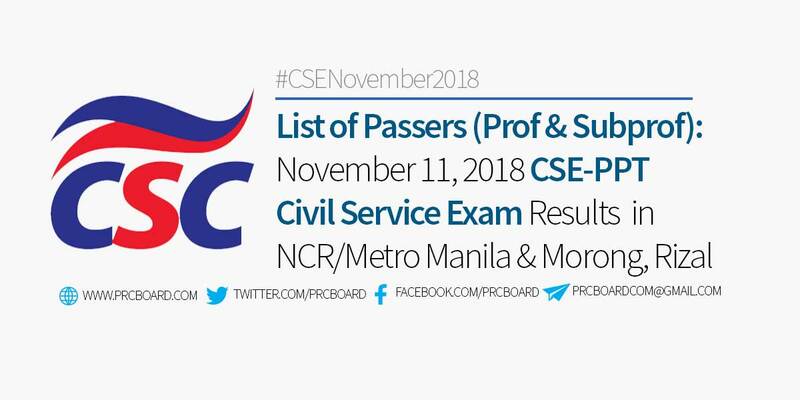 MANILA, Philippines – The results and list of passers of the November 2018 Civil Service Exam (CSE-PPT) for Professional and Subprofessional levels in NCR/ Metro Manila and Morong, Rizal including the top examinees and related announcements are released by the Civil Service Commission (CSC) within 60 days after the eligibility exams. The exams are administered by the Civil Service Commission on November 11, 2018 (Sunday) at CSC testing centers located in the National Capital Region (NCR) and Morong, Rizal. CSC further announced that 4,118 out of 37,994 examinees (10.84%) passed the Professional level while 865 out of 7,505 (11.53%) hurdled the subprofessional level. Below is the list of passers for November 2018 Civil Service Exam - Pen and Paper Test (CSE-PPT) results for Professional and Subprofessional levels courtesy of CSC. The CSE-PPT for the above-mentioned locations was originally scheduled on August 12, 2018 but later moved to November 11, 2018 due to bad weather conditions and flooding during the original date of exams. The scheduled Career Service Examination Pen and Paper Tests are for government employees who aren't eligible yet and want to apply for permanent position or a promotion. The eligibility exams also give opportunities to employees under job order and contract of service. CSC's regular conduct of the Career Service Exam, Pen and Paper Test (CSE-PPT), both for Prof and Subprof levels are scheduled twice a year to cater the growing number of examinees. In the most recent Civil Service Exam conducted on August 2018, 22,087 out of 181,985 (12.14%) combined examinees passed. 19,510 out of 159,283 (12.25%) examinees passed the professional level while 2,577 out of 22,702 (11.35%) hurdled the Subprofessional level. Salveregina Samuelle Sarnillo from Central Visayas (92.35%) ranked first in the Professional level while Sophia Isabelle Olalia from Southern Tagalog (90.78%) topped the subprofessional level. During March 2018 exams, 25,602 out of 238,966 (10.71%) passed the Professional Level while 4,573 out of 40,821 (11.20%) hurdled the Subprofessional level. To receive up-to-date news about November 11, 2018 Civil Service Exam results, we advise our visitors to bookmark this page, visit CSC official website or follow us at our social media pages via Facebook and Twitter. sang taon na yata aq nag inquire regarding result wala tlga lumalabas.